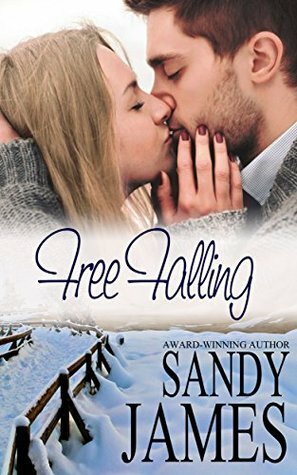 Free Falling is book two in the Damaged Heroes series. I've enjoyed the other Sandy James books I've tried so knew I had to give this one a go. The blurb caught my attention when it said the leading lady had an empathic ability. This is set as a Contemporary Romance but it does have a bit of Suspense mixed into the story. We start off meeting Laurie Miller who is a psychologist at a free clinic that desperately needs a break. Her empathic power is on the fritz and with all the stress she heads out to her family's home in Montana. A blizzard hits and Laurie sees someone stranded on the side of the road and goes to help him. This is how we meet Ross Kennedy, a lawyer that was sent to Montana for a break but also to have someone sign a document. Laurie luckily saves him in time from the freezing weather and the two warm up together by the fire. Sparks fly and the duo decide to look each other up when they're back to their normal lives in Chicago. During their stay at the Montana house, Laurie finds a Prohibition Era journal from possibly someone in her family. It brings her ex-boyfriend back into the picture and secrets are unveiled that Laurie and Ross have to figure out if their relationship can withstand it. Free Falling had a bit more suspense than I anticipated and I wound up enjoying it! I'm usually not a big fan of that genre but this had just the right mixture of romance and a sliver of paranormal with the suspense. While the book was a bit predictable for me in some sections, the story overall was well written and kept my attention. So far it looks like this series can be read as standalone books if you want/need to. Ross's character was in the previous installment, but you'd be fine starting with this one if you wanted. All in all, I really enjoyed this novel and recommend it for anyone looking for a Contemporary Romance with a bit of suspense tossed in. Suspense romance? My! Wouldn't have anticipated that just by seeing the cover. Great review! I'm always down for some suspense. Although, the cover doesn't seem to portray any suspense. So I could see it being a shock when it pops up. Sounds like a good story though. Yeah, it started out as a normal contemporary with a touch of paranormal (she has empat powers). Then it added in suspense when her ex came back in the picture. Suspense can be good if done right. Glad you liked it. It sounds like an enjoyable read! I like suspense if it's well done, haha. Had a good mix of it in there! Glad to know you enjoyed it, even though this is not your typical read.